Hearty, simple and extra comforting, this Greek chickpea soup recipe (revithia soupa) is with no doubt the perfect dish for a cold winter’s day! Greek chickpea soup is one of the most popular Greek wintery dishes, among other soups like Greek lentil soup and fasolada. A highly nutritious and delicious vegetarian Greek dish, full of fiber and a unique supply of antioxidants. So, if you love chickpeas then this Greek chickpea soup recipe is a definite must try! Greek chickpea soup recipe (revithia soupa) is made with humble ingredients, but it’s simplicity of preparation and presentation takes nothing out of its deliciousness! 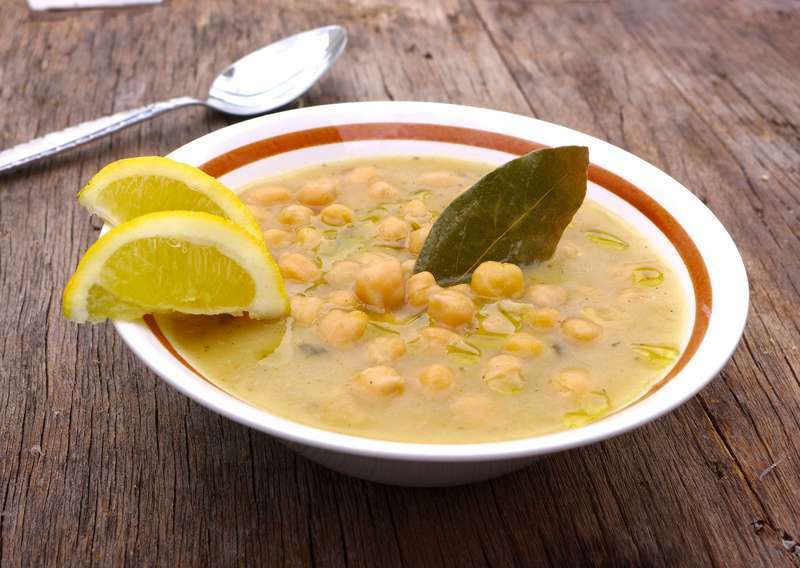 A basic recipe for ‘revithia soupa’ consists only of chickpeas, onions, olive oil, lemons and water. To prepare a Greek chickpea soup recipe it is important to soak the chickpeas overnight for them to become tender and to reduce cooking time. Depending on how fresh the chickpeas are, the cooking time may vary greatly, so it is important to check if they are done. Different variations include other herbs and spices so feel free to spice things up! Bay leaves, fresh or dried oregano and some minced garlic will surely lift the flavor! A very nice addition is to also add some vegetable or chicken stock along with the water to enhance the flavor. Some variations also include carrots, celery and tomato paste to redden the soup. Serve this delicious traditional Greek chickpea soup while still warm with freshly ground pepper and of course some village bread to dig in all that delicious sauce! Enjoy! To prepare this Greek chickpea soup recipe (revithia soupa), start by washing the chickpeas and let them soak in plenty of cold water overnight (ideally for 18 hours). When you are ready to make this Greek chickpea soup recipe, drain the chickpeas (revithia) and discard the soaking water. Place the chickpeas in a colander and rinse very well with plenty of water (4-5 times). Put your hands in the colander and rub them well. Place the revithia in a large pan with enough cold water to cover them (about 4cm over the chickpeas). Turn the heat up and bring to the boil. Keep removing the froth from the top with a wooden spoon for about 15 minutes. Drain the chickpeas and then put them back in the pan and add enough warm water to cover them again. Bring to the boil and add the olive oil, chopped onion, oregano and bay leafs. Turn the heat down to a simmer and place the lid on. Let the revithia cook for 1-2 hours, depending on the chickpeas, until tender. Add more water if necessary in order not to dry. If you prefer your soup to be thicker, during the end of cooking time add in a bowl the flour and lemon juice and pour gradually 1-2 ladles of the soup and whisk. Add the mixture slowly in the pan with the chickpeas and season. Stir gently for 2-3 minutes until the soup thickens. Serve this Greek chickpea soup while still warm with lots of Kalamata olives and crusted bread aside. Enjoy! I don’t use oregano I prefer to use dill which has a far better flavour and a very appetising smell. fresh dill, a couple o pcs chopped when you add the oil then I add a little more at the end with the lemon 1/4 before removing from heat. I don’t add garlic, don’t think it’s necessary for the flavour. I used 2 tbsp oregano as is suggested here and I refer it. It tastes much better without it, and if someone likes to add I think it should be much less that’s that. The revithia is all green and bitter now. I prepared this soup last night, if it can be called a soup. First of all the red onion turned the liquid into brow colour, and it didn’t look anything like on your pictures. Then, the 1-2 lemons, I added half a lemon and it was too acidic. The tickening of it, put 2 tbs flour as you mentioned, didn’t ticken it enough. So it turned out awful on taste, awful in colour and not worth putting more than 2 days of work in it. Sorry about the honesty! Betty, I’m sorry you had such a bad experience! I swear it’s worth trying again…..this is a staple in our house and everyone I’ve made it for has loved it. I make mine a little differently, but I think it would probably be rude to post my own recipe. I’ll just suggest you omit the oregano, flour, etc. Use a white or brown onion. We always use a chicken bullion cube. You don’t HAVE to presoak – I never do–it just takes longer to cook. When you serve it, give everyone a lemon quarter and let them squeeze lemon in to taste. I am married to a Greek and this was his mother’s method. I usually make on the stovetop, but it works just fine in a crock pot. When do you add salt to this dish? During soaking? Beginning of boiling or at the end of cooking? I have tried this dish so, so many times but my chickpeas are always slightly hard and I end up boiling them for up to 5 hours! Help! Copyright © 2019 My Greek Dish. All Rights Reserved.